When Mercedes Clemens and I launched The Equiery, we had no formal publishing experience, and thus we made it up as we went along. We set our own rules, we experimented. Some things worked, some things didn’t. And we learned. We learned the hard way, but we also learned through the kind mentorship of others. We were fortunate to be in the Mid-Atlantic region, not only because the Mid-Atlantic boasts one of the largest and most influential equestrian demographics in the country, but because it is also home to numerous national equestrian publishing powerhouses. Perhaps because we were not competing in the same direct market for business, these publishers took us under their wings. And for that, we are so very grateful. And to know we have done well enough to earn the respect of those who are now our industry peers is a high honor indeed. While each of the publishers featured below played a special role in mentoring, Rich Wilcke will always hold a special place in my heart, for his sometimes day-to-day coaching, pep talks, and unique wisdom. He personally mentored me not just as a publisher, but also as an industry leader, helping me understand that volunteer organizations require a different set of leadership skills than do upstart young businesses. I will forever be grateful to him. I would be remiss, however, if I did not also mention the overwhelming support we received from so many others in the equestrian publishing industry. We had no money to pay for content, and yet some of the industry’s greatest, most award-winning writers and photographers contributed their work to The Equiery–for free! Wow! What an honor. Starting with the late, great publisher and editor of The Chronicle of the Horse, Maryland native son Peter Winants, to photographer Cappy Jackson, writer Margaret Worrall, Baltimore Sun reporter Ross Peddicord–the list is just endless, and we are so very grateful for their faith and support in us. On behalf of all our readers and advertisers, thank you, my mentors…my colleagues…my friends. It has been–and continues to be–a privilege. I feel fortunate that The Equiery was launched very shortly after I entered the horse industry here in Maryland. What would I have done when I needed information on a boarding stable for a retired polo pony? 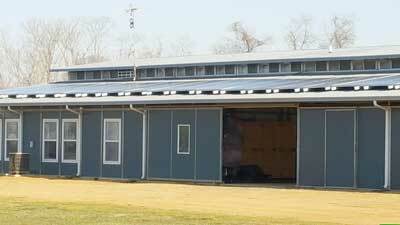 Or a driving barn for a PMU horse? Or where to shop for presents for all those horsey friends? Not to mention the fun of seeing in a recent issue the trainer who convinced the PMU horse that dressage wasn’t so bad. Maryland is one of a handful of states that has an active, involved horse community spread across the state, and I believe it would be a much less vital community without The Equiery to bring it together. Whether in print or online, The Equiery keeps us in touch with different breeds, other disciplines and a variety of horse events across the state–and that’s what makes it special to horse people in Maryland. What a remarkable achievement for any printed publication to last 25 years in the electronic era. The Equiery has not only lasted, but is thriving! It speaks to the quality of the content and determination of the staff to bring the readers what they want in each issue. It speaks to the leadership of the publisher to lead that staff in a sustainable way to this milestone. Nothing but dogged persistence and creative genius could lead the effort forward so regularly and routinely. Me? I’m a paper reader. I’m not old (in my mind! )–just 57. Still, with so much information available, I like picking up my trusted bible, sitting on my sofa for a good old fashioned read. It’s my touchstone with the world, and I’m not going to give it up. Especially if it is packed with information that is about me, my world, my horses, my friends, their horses and the events I have been around since I was nine. The Equiery is that trusted friend. I always pick up every issue and learn something that I didn’t know. Just like a friend that I see at the in-gate, the tack store, the feed store, or out and about the region, I can trust that the information is correct and what I need. Long-live The Equiery. I’m already looking for the 50th anniversary issue! Not many independently published magazines last 25 years, so hats off to the founders for coming up with the right business plan for The Equiery to succeed and to make a lasting impression on–and contribution to–the Maryland horse industry. 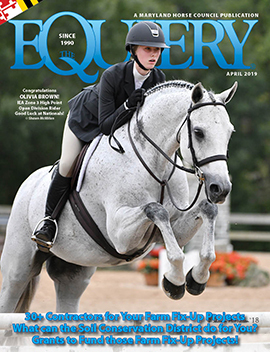 The Equiery has become a must-read for any person connected with Maryland horses and it performs a great service by keeping a very diverse and large industry up to date on all of its many facets. Starting in the 1930s, the venerable Maryland Horse magazine portrayed the horse interests of Free State citizens as mostly, if not exclusively, those of Thoroughbred racing, steeplechasing, and, of course, foxhunting. By the late 1980s, however, it had became evident to some of us that this state’s horse industry was, or had become, far more varied and dynamic than revealed in the pages of that dignified and comfortable old coffee-table publication. As executive vice-president of the Maryland Horse Breeders Association (publisher of Maryland Horse), and as the horse representative on the Maryland Agriculture Commission, I felt that the entire spectrum of the industry in Maryland should be served by a print periodical of some kind, and that if–and only if–such a new publication were managed aggressively and professionally, it might very well have a chance to be a commercially feasible enterprise. Even if I had come up with a perfect model, membership associations such as MHBA are rarely effective, and never nimble, competitors in business, so while we experimented for a while with a more expansive approach to the Maryland horse industry, it soon became apparent that our more sensible course was to focus on broadening coverage of our traditional market, hence, the establishment of MHBA’s new magazine, the Mid-Atlantic Thoroughbred. With the perspicacity common to many successful entrepreneurs, Crystal Brumme also saw the potential in a broad-based horse publication for Marylanders. She and I worked together about that time in an effort to reinvigorate the Maryland Horse Council, and I took a sincere interest in her yeoman efforts to launch a modest publication called The Equiery. I wondered if she would have enough smarts and energy to make it succeed, but I shouldn’t have wondered. For any small business enterprise to be a success requires an entrepreneur with a clear overall vision, the flexibility to react to constant challenges during growth, and the determination to see it through. Given that a) over 90 percent of small businesses fail within several years, and b) the Internet has caused a failure of hundreds of print publications over the last 15 years, the continued success of The Equiery is worthy of a business school case study. Congratulations to Crystal, and to all of her readers, advertisers and staff. NextWill the Breeding Business Bounce Back?